"He wants to get away from this issue as fast as he can." 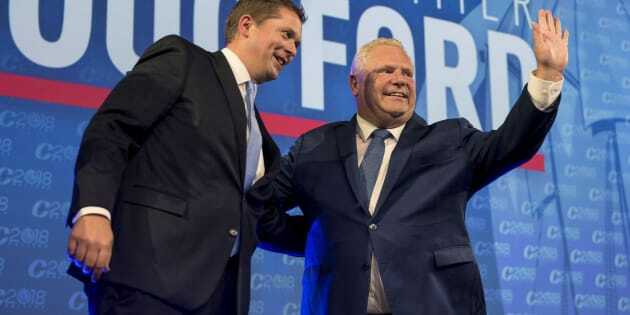 Ontario Premier Doug Ford and Conservative leader Andrew Scheer on stage at the Conservative national convention in Halifax on August 23, 2018. OTTAWA — Conservative Leader Andrew Scheer says the Ontario government is well within its legal rights to use the Constitution's notwithstanding clause to cut the size of Toronto's city council but would not say whether he thinks it is a good move or whether he would ever use the clause himself. Scheer would only say that the decision is ultimately in the hands of the Ontario provincial government and that is up to Ford to explain his decision. Premier Doug Ford and Prime Minister Justin Trudeau make their way to their talks at the Ontario Legislature, in Toronto on July 5, 2018. "It's a difficult dance for Scheer, so I'm sure that's why he's using cautious language like 'within the law.'"